A blog about feeding myself and others. I am at woodworking school in Maine for 2 weeks. My classmates ask me why I am here. I know it is because it is the process that attracts me to the endevour. 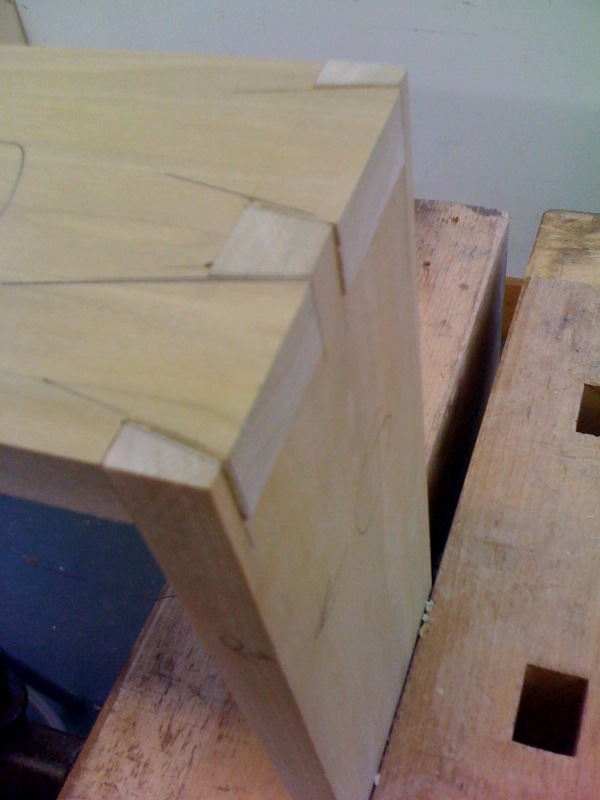 Here is my first dovetail joinery. It took me forever to do, isn't much, crude, and I plan to do many more, but I am enjoying the process. The dovetail ends of these boards will be cut off and I'll start again. Everyone else in the class has at least taken a shop class sometime and as it happens everyone seems to have a home workshop and has made things... except me. What was I thinking coming here having never made anything before, my workbench neighbor asked. Then later I realized that I was starting pure, if not just ignorant. There is nothing for me to unlearn. I didn't know there was a difference in how things are constructed and never will. It was the second epiphany of the day. The first was touching the back of a cabinet in the school's gallery. It was like glass, but warm and instead of reflecting the wall and my hand, it spoke of tree. It was humbling. It is another universe. What was I thinking coming to this class? I just like to do. Beautiful. But at 4:06 AM? An old cook, gardener, forager, farmers market vendor, private chef, traveler, book designer, homebody, feeder and eater...and now furniture-maker aspirant!